Always current. The IC3 certification never expires. You are certified for life. What is IC3 Certification? Internet and Computing Core Certification (IC3). IC3 certification documents your digital literacy skills. The exams generally cover how computers work, how to work within the Windows operating system, basic operation of office applications, networking basics, electronic communication (e-mail), and the Internet. Any Job. Any job with exposure to computers will use the knowledge IC3 certification requires. Many employers use IC3 certification to document a job candidate’s computer skills. What else? Obtaining your IC3 certification proves you have initiative and ambition, and provides you with a stepping stone to higher level computer credentials such as MOS, CompTIA Strata, CompTIA A+, etc. Computing Fundamentals – covers subjects needed for a foundational understanding of computing for computer hardware, software, and operating systems. Key Applications – includes questions covering word processing, spreadsheet and presentation software applications. Living Online – covers aspects of working in an Internet or networked environment, including surfing the Net and e-mail. 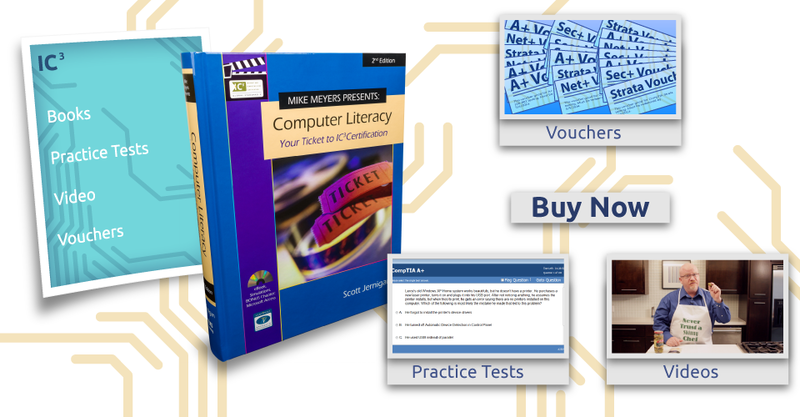 Total Seminars’ Mike Meyers Presents: Computer Literacy, Your Ticket to IC3 Certification provides an in-depth certification roadmap for users and professionals who want a solid grasp of these three basic individual exams. This along with their CompTIA A+ and Network + training books, lab manuals, and practice test software propels Total Seminars into a league of their own in the IT training field. Your choice should be clear: Total Seminars wrote the book on IC3 Certification because they are the experts. When you have expert guidance from one of the most experienced leaders in the industry, you are sure to do well. Let Total Seminars lead you to the success you deserve. Contact us today and begin tomorrow with a clear advantage. Benefits of IC3 credentialsEmployers on a global basis are beginning to recognize these IC3 Certification credentials. After receiving these credentials, you should display them proudly on your resume. They should help you get employment wherever computers are in use.